What is that certifiably insane time traveler up to THIS TIME? One time, the Star Trek crew cheated death with the transporter. Our hero dissolved in atoms, presumably dead, but luckily, the transporter still had his pattern. After I saw that, I began questioning every single use of the transporter. Did it move somebody from place to place or did it destroy one body and create a clone, with all the same memories? Does consciousness continue or cease? From there it’s not hard to wonder: is the person who wakes up in the morning the same as the one who went to sleep at night? My consciousness ceased, for a time, as my unconscious mind pruned memories and integrated what remained into the semblance of a whole? What remains the same, sleeping to waking? What makes a person themself? Is it memory? Or is it something else? The question of the Doctor’s memory also plays a crucial role in the episode “Heaven Sent,” in which he must repeatedly undergo the horrific procedure of fleeing from a monster until mortally injured, then annihilate his own body to create himself anew — by throwing a switch that looks uncannily like the TARDIS takeoff control. And yet, although his body is destroyed, some part of him remembers. “Twice Upon a Time” concludes Stephen Moffat’s exploration of memory and identity with a mysterious entity, Testimony, that manipulates both memory and forgetting. Testimony removes people from time just before their death to copy and thus preserve their memories, and then makes them forget the event and returns them to the moment of death. But the First and Twelfth Doctors accidentally interrupt the proceedings and end up trapped in a frozen landscape in which nothing can change. Not even a snowflake can move: when the Doctor tries, it simply returns to its place of origin. And then Bill appears. But is it Bill? Or is it a copy of Bill, trapped by Testimony in glass just as surely as the snowflake is trapped in midair? The answer, for her, is yes to both. Testimony-Bill asserts that she has all Bill’s memories, and she is Bill’s memories, so she is Bill. Identity is memory. He finishes up with heroic grace: “Doctor, I let you go.” The statement gives us the emotional effect of resolution, but it’s also quite ambiguous. Who is the “I” that lets go of the Doctor? We could all ask that question. Who is “I”? And so the Doctor regenerates, going out in flame right along with his partner the TARDIS. And Stephen Moffat has cleared the worktable for the new showrunner and for the new Doctors, whoever they may be. The Gate of Memory by Dante Gabriel Rossetti [Public domain], via Wikimedia Commons. That’s not a TARDIS in the background . . . is it? This panel on the past and future of female Doctors may have been poorly named, considering that Jodie Whittaker has already been cast as the Thirteenth Doctor, but the conversations were great. Raven Oak moderated, and the panel consisted of Eric Gjovaag, Mark Dando, and Denise Nilsson. Eric Gjovaag got the conversation off to a productive start with a brief video showing fan appearances of female Doctors, starting with a clip featuring Barbara Benedetti. (More info on these films is available on director Ryan K. Johnson’s website.) That way, the panel and audience started out with a lot to chew on. The video also had a moment from The Curse of Fatal Death and some other works I can’t recall off the top of my head. There’s a generation gap in fan reaction. People who grew up with Classic Who may find this quite a departure. On the other hand, the younger generation seems ready. Some of these videos continually referenced the fact that the Doctor was a woman. If the new show does that, it won’t turn out well. Some of this came up when Missy appeared as the latest incarnation of the Master. While it’s true that the Master has always been a complete ham, there was some discomfort about having her gender and sexuality continually referenced. Someone popped his head in and got the audience roaring with laughter by asking: “Will she get equal compensation?” GOOD QUESTION. Someone proposed Idris Elba as the fourteenth Doctor. I agree. Are Fans Ready for Jodie Whittaker? I never expected to see a woman play the official “Doctor Who,” but here we are, with Jodie Whittaker cast as the 13th Doctor. Are the fans ready? Not entirely. This weekend at Anglicon 2017 I had one telling experience, with one high-profile guest doubling down on previous comments opposing the casting. He had already been publicly criticized for those comments and had taken those comments as “getting in trouble” unjustly. This tells me that either nobody sat down with him and had a thoughtful conversation on the topic, or that somebody tried and he didn’t listen. Either way, the communication failure is frustrating! What follows is my recollection of the comments, to the best of my ability, though memory is fallible, and my response. Some of the best episodes of the show have been political satire, like “Aliens of London,” where the top figures of government are replaced by windbags, or “The Long Game,” where human civilization is controlled by aliens, through the media. So what do you mean by “politics”? It’s the opposite. The simple truth is that for a long time casting a female Doctor was considered “politically incorrect” and even now, it’s a risky move. She will face criticism like you would not believe, from women and men both. The logic of your comment seemed to be: Since we’ve had fifty years of male Doctors, to balance the ledgers we’ll have fifty years of women. Don’t worry! Misogyny is alive and well in Western culture, and men and women alike both judge powerful women harshly. How many fans liked Captain Janeway? How did Hilary Clinton lose the election? But even in the absence of misogyny, why bar men from the role. That makes as little sense as — well — barring women. For the record: I vote for Idris Elba as the fourteenth Doctor. Okay, some people in the audience were offended by that, but I used my magical ability to create “head canon” (fandom’s phrase for “the show as we wish it was”) to convert it to “losing the Doctor as a male role model for boys,” and I’m actually sympathetic to that. There is a gender-utopia view that kids can be anything, do anything . . . and yet, many if not most still look to same-gender adults when shaping their identities and planning their future careers. And yes, the Doctor is unique as a male role model. He hates guns and uses intellect to solve problems instead. He has boundless compassion and is not afraid to cry. The truth is, we have precious few heroes like that. See #3. There will be plenty more male Doctors, I’m sure. A generation of boys will not lose that. Boys can take women as role models. By the way, I’m the reason my son is a Doctor Who fan. Since a gender-specific Doctor is so amazing for our sons . . . why would you want to deny that opportunity to our daughters? I grew up a Star Trek fan and gladly imagined myself in the role of Captain Kirk, and later the Doctor. That worked for me. It doesn’t work for my daughter. When I watch Doctor Who, I live vicariously with both the Doctor and the companions. The Doctor gets to have power and to talk smack to the ruling class. The companions, meanwhile, get to take a break from their regular lives and go on a thrilling extended vacation. That’s my expectation, anyway. And when it’s broken I get seriously pissed off. I like to see companions take a journey of personal growth and end up somewhere different-and better-than where they started. For me, the bar was set by Nyssa, who departed from the Tardis to hunt for a cure on a plague planet. (I’m deliberately not considering the possibility that the plague kills her.) Few companions have been treated that well, though. They’ve been killed, married off, suffered memory loss, simply been abandoned, or gotten stranded in time. And when I’m living vicariously through the companion, that’s disappointing. In Series 9, Clara Oswald departs. Does the show do her justice? I’d say yes. She continues on the trajectory established in the Series 8 episode “Flatline,” in which she temporarily takes on the Doctor’s name and token of power to act like him. But as Clara becomes more and more like the Doctor, she’s also punished for it. She’s seen as a danger junkie. And in “Face the Raven,” her actions kill her. Definitively. We watch her die. Many fans are sad. I’m not sad. I don’t get sad when companions have bad endings: I get furious. But two episodes later, in “Hell Bent,” we see her again. How is this possible? We’re in a time travel show. Clara is snatched out of time, just moments before her death, and in between one heartbeat and the next she has an infinity to explore. (She’s “in-between-finite,” a term I learned from you-tuber Vi Hart in an entertaining discussion of Pi.) She ends up with a Tardis and the ability to defer the moment of her death as long as she likes. In her last scene, she spins off in the Tardis to have adventures. She gets to fulfill her destiny as a wandering adventurer. Sweet. Even sweeter: fanfiction writers are taking the scenario and running with it. On sites like Archive of our Own, Fanfiction.Net, and A Teaspoon and an Open Mind, people are paring up Clara and her traveling companion Ashildr and writing stories like crazy. In Doctor Who Series 8, companion Clara Oswald came into her own. The actress, Jenna Coleman, simply shone. She was strong, brittle, funny, powerful, beautiful, unique. And she continued to maintain her life outside the Tardis. But the storyline itself betrayed her by pitting her accomplishments on board the Tardis against an otherwise compelling relationship with a richly characterized man. In so doing, it failed both Clara Oswald and Danny Pink. From the moment we meet Clara Oswald in Series 6, she is something more than human. She’s a human/Dalek hybrid who has resisted Dalek conversion better than anyone ever–so well that she takes over the Daleks’ telepathic world. She is plainly and simply human in the beginning of the first episode of Series 7, but in the middle of the show, she gets a brain upgrade of alien origin that makes her hyperintelligent. She’s off on a hero’s journey, and it’s amazing. Through it all, she never fails to maintain her connection to her “real life,” the life Human Clara had chosen for herself before becoming entangled with the Doctor. Then the end of Series 7 hits and Clara has another upgrade of alien origin, one that splinters her throughout time and space to live a thousand different lives, playing the hero in each of them. She also literally enters the Doctor’s essence, getting to know him arguably better than any other companion–so much so that in later episodes she starts to become the Doctor. So what is in store for her in Series 8? A smackdown. She starts a relationship with a man named Danny Pink, a former soldier with his own complicated past and his own heroic journey to undertake. Just as in Series 7, she attempts to keep her home life and Tardis life separate. But two people won’t let her: the Doctor and Danny Pink. Danny sees the abusive aspect of this relationship and names the Doctor, accurately, as a military commander. He predicts a moment when the Doctor will push Clara too far, and when that moment does come, he’s ready as a friend with a hug and some solid advice. But he oversteps himself and in so doing enters abusive-boyfriend territory. This is a lovely, chill-down-the-back moment. Danny’s right. Clara promises to tell him. So far, so good. Stop right here, and it’s a brilliant setup for the drama of the season. This is emotional manipulation. Instead of stopping at giving the her emotional support of a friend, an equal, he’s insisting on being her protector. And she never once calls him on it. She spends a fair bit of the season lying to him–going off with the Doctor and telling him she’s not–and I can only assume it’s because Danny has threatened to break off the relationship. This is not acceptable behavior. Worse, Danny never acknowledges that Clara has been doing anything of import in her adventures aboard the Tardis. And we never see him asking about her past. Apparently, he’s satisfied with the half of Clara that likes to teach and hang out with him. Meanwhile, Clara’s perfectly willing to give Danny the impression she’s something less than she is. That shows a lack of respect for him. While Clara and Danny are having their strange, dysfunctional relationship, Clara’s heroic journey is charging forward, full-steam ahead. In “Kill the Moon,” she confronts the Doctor to call him on his B.S. A few episodes later, in “Flatline, she literally takes on the role of the Doctor, complete with moniker, sonic screwdriver, and her own companion. She has a moment of epiphany when she asks herself, “What would the Doctor do?” and then corrects herself: “No. What would I do?” She has come fully into herself as a hero. Then what? Two episodes later, in “Deep Water,” she gets a smackdown. Danny has confronted her about lying and said (finally!) that he’s okay with her traveling in the Tardis, as long as she doesn’t lie to him. So she starts off ready to confess everything. There’s an opportunity for them to finally have it out, for Clara to lay claim to her personal growth and accomplishments . . . but before she can manage it, Danny is suddenly killed (fulfilling the “Black Man Dies First” trope, by the way.). Clara is devastated. She finishes out the season as an emotional wreck. Her heroic journey is cut short. There’s an age-old question this season appears to be playing out, badly. Can a woman be a good wife/mother/girlfriend and have her own life, too? Apparently not. We should just stay at home and let our men protect us. This treatment wasn’t fair to Danny, either. It sidelined his own heroic journey, which was actually one of the most moving if you look at it in isolation. As an ex-soldier who left the army after accidentally killing a young boy, he became the one man to defy orders and save the Earth from Cybermen, and then, given the chance to return to life, sent the young boy instead. I doubt the showrunner, writers, and editors meant to send the message they did. I think Danny’s sudden possessiveness, which destroyed Clara’s storyline for me, was just a slip-up. And that’s embarrassing. The show can and should do better. Looking forward, in Series 9, it does. Mostly. But that’s a topic for another time. I’ve been working off and on over the years to create little bits of feminist analysis on the Doctor Who companions and thought I’d share them here. There’s a demand for “strong female characters” in our popular media, and the show has responded to it. Has it succeeded or failed? Both, of course. If there is a Feminist Ideal, and could a character live up to that ideal without being overly perfect, or contradictory, or both? I found myself in the strange position of judging the female characters. (Are they strong? Do they get to be the protagonists? To what extent are they the equal of the Doctor? Which stereotypes do they fit into, and which do they resist?) How catty of me. So here are my links. None of them represent The Final Word on feminism, the companions, or anything else. They’re what I saw, as I saw it at the time. Zoe Heriot from the Patrick Troughton years, seasons 5 and 6. 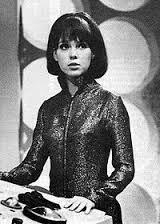 I fail to provide any criticisms whatsoever, because she was the first companion I ever saw and I simply adore her. She’s in black and white, she’s a screamer, and she’s the best. Amy Pond in “The Eleventh Hour.” The Doctor meets the little girl Amelia Pond, and this visit marks her for life and transforms her into his perfect traveling companion. He leaves in his TARDIS, promising to return in five minutes, but instead returns when she is a grown woman. Was this accidental, or deliberate? Whose purposes did it serve? River Song in “Silence in the Library” and “Forest of the Dead.” Fan reaction has been mixed for this character, but I argue that she is powerful throughout. I might be reading more into this character than I should, but hey, it’s fun. River Song after “The Time of Angels” and “Flesh and Stone.” I waffle back and forth between saying she’s a stereotype and saying she isn’t, and between saying she’s powerful and saying she’s not. Clara Oswin Oswald after “Hide” and again after “Journey to the Centre of the TARDIS” and again after “The Crimson Horror.” Honestly, I don’t know what to think about her. Clara Who? Clara Oswin Oswald in Series 8, written immediately afterward and again upon more reflection. She’s both extremely powerful and strangely mired in a bad relationship that depends on her pretending to be something she’s not. And finally, Clara Oswin Oswald’s departure in Series 9.